Taste test: When I first opened this bag and saw many large, unbroken, narrow-rippled chips inside, I was very optimistic. Unfortunately, the taste the chips was kind of bland. Most of the chips just didn't have enough flavor and tasted very flat after the first bite. 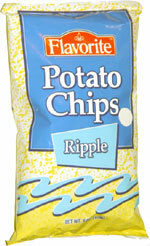 Some of the saltier ones were better, but still, not a great ripple chip.